Perfectly Created Chaos! : Lots of Cards! It's early in the morning and we are waiting a pretty good winter storm forecast to hit us in the next few hours. They've already canceled school for today so everyone is sleeping. Hey, I might actually get two cups of coffee in peace and quiet this morning! 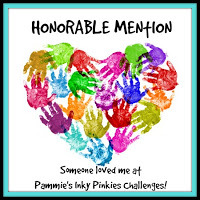 So today I have 3 cards to share with you! I know...crazy isn't it?! Lots to talk about, so charge your coffee and pull up a chair! I've been doing a lot of stamping lately because I've been trying to do challenges as well as ma ke cards that I'm just finding random inspiration for. The problem is that I'm having a hard time figuring out when to post what. So in order to get back on track I'm going to post the three that I've done most recently. 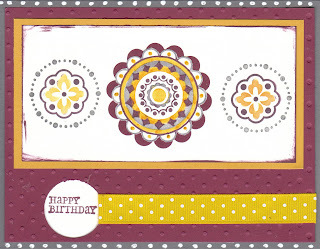 First I have my card for last week's SCS color challenge using Bravo Burgundy, Grey and Crushed Curry. This was a really nice combination and I'm glad I did it. I used Circle Circus with markers for the images. I don't actually have a Crushed Curry marker so I used Mostly Mustard and Summer Sun. You can tell I used two different yellows on the two side images, which was not intentional; but what can you do right? I wish I would have chosen a bigger sentiment for the open circle at the bottom. The one I chose seems a bit off. 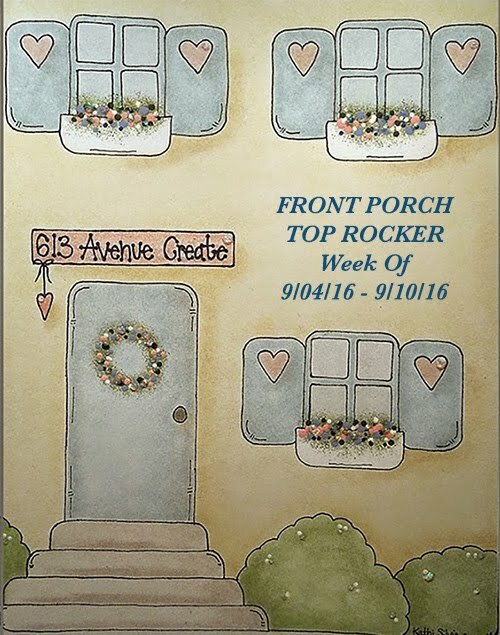 Ok, so the second card I have is for this week's Mojo Monday Challenge. I have seen lots of Black, White and Red cards lately and they've all been fabulous, so I thought I'd make one of my own. I don't think there's much expla nation needed for this card. I used a couple of Cuttlebug folders on the red and the white. The sentiment at the bottom is from SU's "A little Something" and I layered it on two pieces cut with my Nestabilities Label One. The flower in the middle is from "Simply Said" and I stamped it on two circles cut with Nestabilities Petite scallop circles. Finally, I have a card that I made for Reagan. I recently got her Taylor Swift tickets and I made this card for her and put the tickets inside to surprise her. I got this stamp set "Rock Star" from Inkadinkado at Michael's a few weeks ago for the scrapbook layout I am doing for the Demi Lovato concert she and I went to back in October. 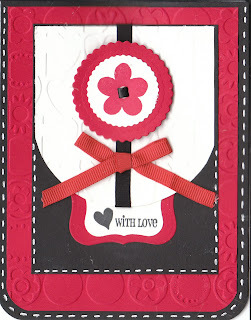 For this card I used black, Melon Mambo, Kraft and Pretty in Pink. I embossed the piece of Melon Mambo piece with the Print Pattern Background from SU with Versamark and black embossing powder. The guitar is stamped with Melon Mambo ink. She really liked the card; but she was obviously much more happy with what was inside the card!!! Ok, so that's all for me today. I hope you all like everything I shared with you, would love to hear what you all think of them. Have a great day and I'll see you tomorrow! Looking good! Lovin the third card w/ the guitar! We're gettin lots of snow today too. 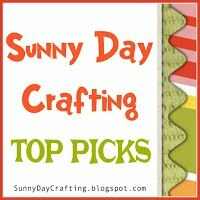 Headed up to the CT Humane Society first to walk dogs then home to craft the day away!!!!!!! 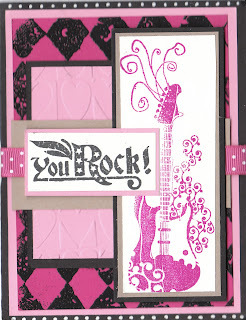 OMG what a fantastic card I love the You Rock card - my fave!! You have had a busy day! 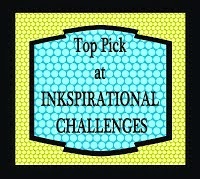 I have been doing the same thing, playing along with lots of challenges and wondering when to post them all! That top card does have a great color combination, I don't think I would have thought of putting them together, but they look great. The other cards are great too, I ma sure the tickets inside will bring some excitement too! Love all these cards! I really love the guitar one though, what a great image.